BIG CYPRESS — The difference is between toothy grins and grumpy frowns. “It’s like night and day,” said Celeste Billie in the waiting room of the new, state-of-the-art dental clinic at Big Cypress. Night is the dank 1980s dental office that was squeezed into a tiny space at the Big Cypress Health Clinic and served Tribal members only three days a week. Day is the 1,200-square-foot, stand-alone dental clinic that opened Aug. 1 with three patient treatment rooms, sunny waiting room, cheerful reception area, wheelchair access, portraits of smiling Tribal members on all walls and a full-time dentist. Dr. Juan Packer, manager of the Seminole Tribe’s dental program and an officer of the United States Department of Health and Human Services, Indian Health Service, said the new clinic features all new equipment and furniture – including flat-screen televisions mounted to ceilings over all three dental patient chairs. “The TVs provide another level of comfort for patients so they can be more at ease. What’s better than watching your favorite television show while getting dental work?” Packer said. For dental professionals and patients, the best feature of the clinic is a Panorex digital X-ray machine that rotates around the head to display both the upper and lowers jaws and teeth in one picture. The addition means patients get a faster diagnosis because they will no longer travel off the reservation for dental images. Also new are two UltraClave sterilizers, computer monitors in each patient room to read digital X-rays, wall-mounted X-ray heads, a dental lab and a dentist’s office. By next year, the office should be 100 percent paperless because all records will be converted to digital files. 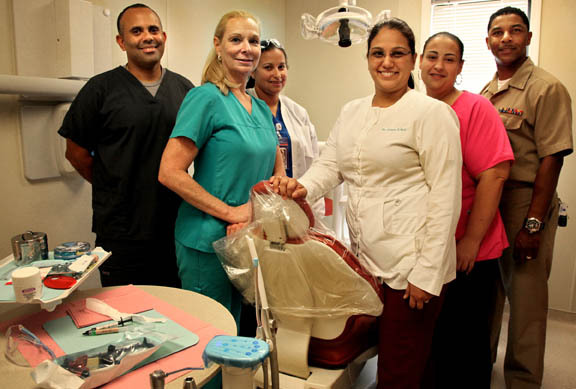 Staff dentist Dr. Claudia Otero said the new, more private clinic provides a more pleasurable patient experience. “We’ve found that it decreases patient anxiety. They are more relaxed and I am more relaxed,” she said. Otero said the larger space also allows her staff of five to see more patients. Dr. Victor Oramas, a pediatric dentist, is available all day on Wednesdays. “We see patients of all ages. All people have to do is call for an appointment,” Otero said. Packer said the Seminole Tribe of Florida’s dental program is one of the top three in Indian County. The award-winning program meets or exceeds all Government Performance and Results Act (GPRA) requirements for funding purposes, which includes providing dental care access and preventing dental disease. Dental care is a huge issue across Indian Country, Packer said. According to the Center for Native Oral Health Research at the University of Colorado, Denver, a 2010 dental survey in Pine Ridge Indian Reservation revealed that 90 percent of the 292 responding adults and children had active tooth decay, about half the adults were missing teeth and a large percentage were in near constant tooth pain. Overall, according to a 2011 Institute of Medicine report, Native children ages 2 to 5 throughout the nation suffer tooth decay three times more than the U.S. average. “Here, our patients are much more fortunate. The (Seminole) Tribe can invest in patients from preventative care to complete treatment,” Packer said. The new hurricane-proof dental clinic, located behind the Big Cypress Health Clinic on Josie Billie Highway, is open 8 a.m. to 5 p.m. Monday through Friday. “It’s nicer, cooler and roomier. It’s great,” Billie said.